Frateuria aurantia (ex Kondô and Ameyama 1958) Swings et al. 1980 is a member of the bispecific genus Frateuria in the family Xanthomonadaceae, which is already heavily targeted for non-type strain genome sequencing. Strain Kondô 67T was initially (1958) identified as a member of ‘Acetobacter aurantius’, a name that was not considered for the approved list. Kondô 67T was therefore later designated as the type strain of the newly proposed acetogenic species Frateuria aurantia. The strain is of interest because of its triterpenoids (hopane family). F. aurantia Kondô 67T is the first member of the genus Frateura whose genome sequence has been deciphered, and here we describe the features of this organism, together with the complete genome sequence and annotation. 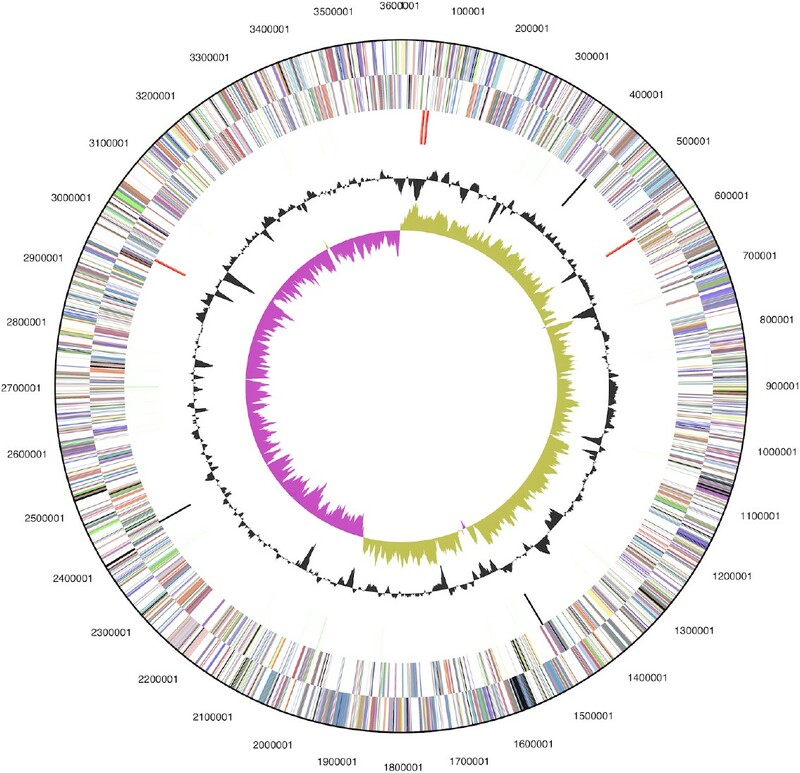 The 3,603,458-bp long chromosome with its 3,200 protein-coding and 88 RNA genes is a part of the Genomic Encyclopedia of Bacteria and Archaea project. Strain Kondô 67T, also known as G-6T and as IFO 3245T (= DSM 6220 = ATCC 33424 = NBRC 3245) is the type strain of the species Frateuria aurantia , the type species in the bispecific genus Frateuria . 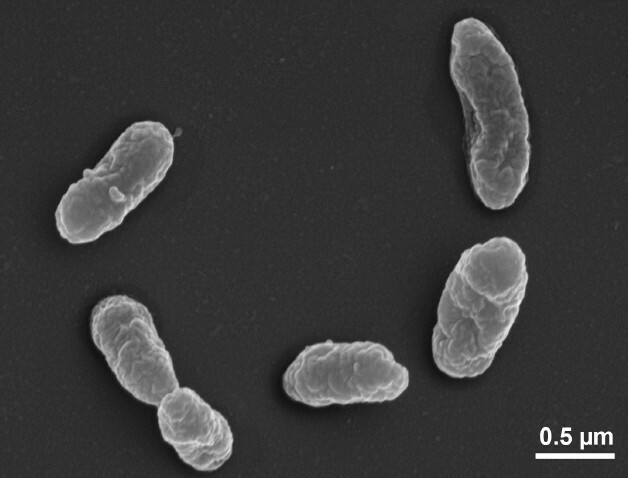 Kondô 67T was originally isolated from Lilium auratum Lindl and classified as a member of ‘Acetobacter aurantius’ from which it was reclassified 22 years later as the type strain of the type species of Frateuria . The genus was named after the Belgian microbiologist Joseph Frateur (1903-1974) ; the species epithet is derived from the Neo-Latin adjective aurantia, referring to the gold-yellow color of the strain on MYP agar . Strain Kondô 67T was characterized as ‘acetogenic’  and as containing triterpenoids of the hopane family . Here we present a summary classification and a set of features for F. aurantia Kondô 67T, together with the description of the genomic sequencing and annotation. A representative genomic 16S rRNA gene sequence of strain Kondô 67T was compared using NCBI BLAST [4,5] under default settings (e.g., considering only the high-scoring segment pairs (HSPs) from the best 250 hits) with the most recent release of the Greengenes database  and the relative frequencies of taxa and keywords (reduced to their stem ) were determined, weighted by BLAST scores. The most frequently occurring genera were Dyella (34.3%), Rhodanobacter (24.0%), Frateuria (19.6%), Luteibacter (11.9%) and ‘Luteibactor’ (3.7%) (105 hits in total). Regarding the eleven hits to sequences from members of the species, the average identity within HSPs was 99.6%, whereas the average coverage by HSPs was 100.0%. Among all other species, the one yielding the highest score was Dyella ginsengisoli (EF191354), which corresponded to an identity of 98.2% and an HSP coverage of 99.0%. (Note that the Greengenes database uses the INSDC (= EMBL/NCBI/DDBJ) annotation, which is not an authoritative source for nomenclature or classification.) The highest-scoring environmental sequence was HM556321 (‘insect herbivore microbiome plant biomass-degrading capacity Atta colombica colony N11 fungus garden top clone TIBW663’), which showed an identity of 99.7% and an HSP coverage of 97.2%. The most frequently occurring keywords within the labels of all environmental samples which yielded hits were ‘soil’ (5.9%), ‘sediment’ (2.5%), ‘microbi’ (1.8%), ‘enrich’ (1.5%) and ‘vent’ (1.3%) (145 hits in total). The most frequently occurring keyword within the labels of those environmental samples which yielded hits of a higher score than the highest scoring species was ‘atta, biomass-degrad, capac, colombica, coloni, fungu, garden, herbivor, insect, microbiom, plant, top’ (8.3%) (6 hits in total), reflecting some of the known features of the strain’s origin. 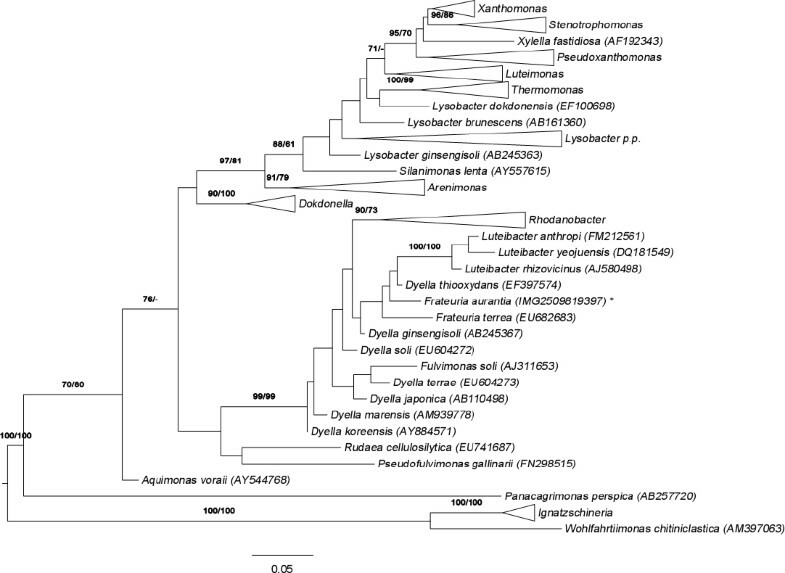 Figure 1 shows the phylogenetic neighborhood of F. aurantia in a 16S rRNA based tree. The sequences of the four identical 16S rRNA gene copies in the genome differ by one nucleotide from the previously published 16S rRNA sequence (AB091194). Phylogenetic tree highlighting the position of F. aurantia relative to the type strains of the other species within the family Xanthomonadaceae. The tree was inferred from 1,431 aligned characters [8,9] of the 16S rRNA gene sequence under the maximum likelihood (ML) criterion . Rooting was done initially using the midpoint method  and then checked for its agreement with the current classification (Table 1). The branches are scaled in terms of the expected number of substitutions per site. Numbers adjacent to the branches are support values from 750 ML bootstrap replicates  (left) and from 1,000 maximum-parsimony bootstrap replicates  (right) if larger than 60%. Lineages with type strain genome sequencing projects registered in GOLD  are labeled with one asterisk, those also listed as ‘Complete and Published’ with two asterisks. F. aurantia Kondô 67T cells stain Gram-negative , were straight rod shaped, 0.5–0.7 µm in width and 0.7–3.5 µm in length (Figure 2)  and motile via polar flagella  (not visible in Figure 2). Cells occur singly or in pairs, rarely in filaments . Cultures grow in dark, glistening, flat colonies with a soluble brown pigment . They are oxidase positive and catalase negative ; physiological features and antibiotic susceptibilities were reported in great detail in . Cells grow well at pH 3.6 and 34°C . Besides trace amounts of diploptene and rearranged compounds like fern-7-ene , the main lipids isolated from DSM 6220T are iso-branched fatty acids and triterpenoids of the hopane family, such as bacteriohopanetetrol and derived hopanoid. The organism also produces ubiquinone Q8 . Classification and general features of F. aurantia Kondô 67T according to the MIGS recommendations  (published by the Genome Standards Consortium ) and NamesforLife . F. aurantia strain Kondô 67T, DSM 6220, was grown in DSMZ medium 360 (YPM medium)  at 30°C. DNA was isolated from 0.5–1 g of cell paste using standard procedures at the DSMZ DNA laboratory and quality control processes requested by the sequencing center (JGI). DNA is available through the DNA Bank Network . The genome was sequenced using a combination of Illumina and 454 sequencing platforms. All general aspects of library construction and sequencing can be found at the JGI website . Pyrosequencing reads were assembled using the Newbler assembler (Roche). The initial Newbler assembly consisting of 36 contigs in one scaffold was converted into a phrap  assembly by making fake reads from the consensus, to collect the read pairs in the 454 paired end library. Illumina GAii sequencing data (2,074.3 Mb) was assembled with Velvet  and the consensus sequences were shredded into 1.5 kb overlapped fake reads and assembled together with the 454 data. The 454 draft assembly was based on 63.7Mb 454 draft data. Newbler parameters are -consed -a 50 -l 350 -g -m -ml 20. The Phred/Phrap/Consed software package  was used for sequence assembly and quality assessment in the subsequent finishing process. After the shotgun stage, reads were assembled with parallel phrap (High Performance Software, LLC). Possible mis-assemblies were corrected with gapResolution , Dupfinisher , or sequencing cloned bridging PCR fragments with subcloning. Gaps between contigs were closed by editing in Consed, by PCR and by Bubble PCR primer walks (J.-F. Chang, unpublished). A total of 43 additional reactions and one shatter library were necessary to close gaps and to raise the quality of the final sequence. Illumina reads were also used to correct potential base errors and increase consensus quality using a software Polisher developed at JGI . The error rate of the final genome sequence is less than 1 in 100,000. Together, the combination of the Illumina and 454 sequencing platforms provided 546.0 × coverage of the genome. The final assembly contained 163,130 pyrosequence and 25,455,174 Illumina reads. Genes were identified using Prodigal  as part of the DOE-JGI  genome annotation pipeline, followed by a round of manual curation using the JGI GenePRIMP pipeline . The predicted CDSs were translated and used to search the National Center for Biotechnology Information (NCBI) non-redundant database, UniProt, TIGRFam, Pfam, PRIAM, KEGG, COG, and InterPro databases. These data sources were combined to assert a product description for each predicted protein. Additional gene prediction analysis and functional annotation were performed within the Integrated Microbial Genomes - Expert Review (IMG-ER) platform . The genome consists of a 3,603,458 bp long circular chromosome with a G+C content of 63.4% (Table 3 and Figure 3). Of the 3,288 genes predicted, 3,200 were protein-coding genes, and 88 RNAs; 99 pseudogenes were also identified. The majority of the protein-coding genes (79.6%) were assigned a putative function while the remaining ones were annotated as hypothetical proteins. The distribution of genes into COGs functional categories is presented in Table 4. Graphical map of the chromosome. From outside to center: Genes on forward strand (colored by COG categories), Genes on reverse strand (colored by COG categories), RNA genes (tRNAs green, rRNAs red, other RNAs black), GC content(black), GC skew (purple/olive). We would like to gratefully acknowledge the help of Markus Kopitz for growing F. aurantia cultures and Susanne Schneider for DNA extractions and quality control (both at DSMZ). This work was performed under the auspices of the US Department of Energy Office of Science, Biological and Environmental Research Program, and by the University of California, Lawrence Berkeley National Laboratory under contract No. DE-AC02-05CH11231, Lawrence Livermore National Laboratory under Contract No. DE-AC52-07NA27344, and Los Alamos National Laboratory under contract No. DE-AC02-06NA25396, UT-Battelle and Oak Ridge National Laboratory under contract DE-AC05-00OR22725, as well as German Research Foundation (DFG) INST 599/1-2 and in part by the Russian Ministry of Science Mega-grant no.11.G34.31.0068; SJ O’Brien Principal Investigator. BAuA. 2010, Classification of bacteria and archaea in risk groups. http://www.baua.de TRBA 466, p. 89.